Learn more about your visitors interactions with videos on your websites with Piwik PRO’s new Premium Feature: Media Player Tracking. Find out if your video content is engaging your users, and how effective your multimedia efforts are. Media Player Tracking allows you to track videos played on your website and supports all HTML5 based content. The feature was designed to gather data not only on the number of users who clicked on the video, but more importantly on how many users paused the video, when they paused it, how many times they did it, if they watched the video to the end if they watched half of it etc. Even though at the moment only the HTML5 videos are supported, other – such as Vimeo or YouTube – will be added in the future and our team is working on the updates as your read this post. One of the useful elements of the Media Player Tracking Feature is the fact, that you can specify the number of thresholds. This could be especially helpful if you have longer videos, or videos where there’s an essential change in the content (e.g. first part is informative and the second more sales-oriented). You can choose if you’ll see if the visitor watched 10%, 20%, 30% etc… of the video on your website. As you set the thresholds it’s important to note, that Piwik PRO will record that user watched a certain percent of the video if he’ll reach past the particular threshold. So if you’ll set 3 thresholds at 10%, 20% and 80%, then Piwik PRO will classify both watching 21% and 79% of the video as having watched 20%. So be sure to keep that in mind. Helpful Tip: Don’t set up a huge number of thresholds. Remember that each one of them will produce additional action while watching the video. Try focusing on thresholds important in every particular video or on most relevant ones to your business. It’s a good practice to set up 3 to 5 thresholds. If you end up with more than 10, I advise you to reconsider. Once you activate the feature, you’ll see a new category in the Piwik PRO Dashboard menu called “Media Player”. There you’ll find the general reports and most of the relevant information you’ll need. This Media Player report provides you not only the data on total number of users who clicked “play” and total number of pauses and resumes (pro tip: if you’ll see a higher number of resumes than pauses, you can be sure there’s something wrong with the report, or the implementation, or maybe with the video itself). You’ll also learn how many visitors watched the video to the end, and how many passed a threshold you set up earlier. With Media Player Tracking reports you’ll be able to compare your videos and see which one is being most effective. A great way to do it is to compare three metrics: the total number of plays, number of pauses and number of finishes. If one of your videos will have a high number of plays and finishes (with a low number of pauses), you can be sure it’s engaging and interesting for your users. On the other hand, a high number of plays paired with high number of pauses and a low number of finishes can suggest a problem with your content. You might be doing something right, the title or image of the video might be intriguing, but then you fail to deliver on the images or title’s promise. But the media player reports don’t end there. If you want to focus on individual users and understanding how they interacted with your video content, you’ll find this information in the Visitor Log. This report provides you detailed look into the visitors who watched your videos. You can analyze the whole process of watching a video from beginning to the end (look at the right side of the image above). You also have a summary describing single visitor (left side of the image above) and you can learn the total time spent on the website and number of actions undertaken by the user. Visitors Profile lets you access other information about the visitor such as on what device the video has been played (desktop, tablet, smartphone) or the country of the visitor. With introducing Media Player Tracking Feature Piwik PRO proves once again that a successful web analytics solution needs to be comprehensive and never fall into the trap of being content with the level of insight and number of features it offers. 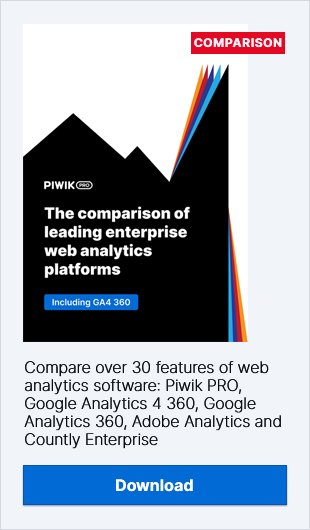 This premium feature is available in Piwik PRO On-Premises version, and soon will also be available for Piwik PRO Cloud users. If you have any questions regarding Media Player Tracking feel free to contact us through our form, or any other social media channel.